Be the first to share your favorite memory, photo or story of Peggy. This memorial page is dedicated for family, friends and future generations to celebrate the life of their loved one. 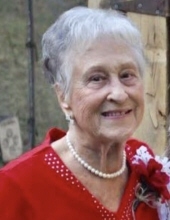 Peggy Thompson “Betty Faye” Bayes 87 of Ashland, KY passed away Thursday, November 29, 2018 at Regional Medical Center in Hudson, Florida. Peggy was born April 26, 1931 in Ashland to the late Willie and Anna McDowell Thompson. In addition to her parents she was preceded in death by her husband Gerald Bayes; one son Walter “Eddie” Stone Jr; two brothers Charles E. Thompson and Robert Thompson; two sisters Louise Sawyer and Ruth Bailey; one step-grandchild Matthew Peterman, and one step great grandchild Abigail Robertson. Peggy was a homemaker, Freewill Baptist, sang with The Gospel Tones, loved to bowl, read, play canasta, and spend time with family and friends. She leaves behind two loving daughters Carol Ritchie (Pat Mays) and Kimberly Stone Hulett (Bob) both of Westwood,KY; three sisters Beulah Murphy of Bluffton, IN, Donna Creamer (Barney) of Inverness, FL, and Janet Kleinknight of Bluffton, IN; one brother Everett Thompson (Marti) of New Smyrna Beach, FL; one step-daughter Sandra Bayes of Ashland, KY; three step-sons William Bayes (Debbie) of McDonough, GA, Martin Bayes (Dotti) and Scott Bayes (Carla) both of Ashland, KY; Five grandchildren Larry Ritchie, Edward Ritchie (Wanda), Shawna Brown, Tabitha Pauley (John), and Timothy Ritchie, four great grandchildren Brett Ritchie (Megan), Seth Marcum, Katie Ritchie, and Cody Ritchie. Eleven step grandchildren Heather Cherry (Jeff), Josh Abdon (Courtney), Lucy Bayes, Collin Bayes (Emily), James Robertson, Tanner Bayes, Makayla Bayes, Kristen Castle, Linda Carrel, Cynthia Alan, and Alan Peterman; ten step great grandchildren Jeffrey Clay (Karlyn), Raven Clay, James Robertson Jr, Lane Abdon, Molly Abdon, Gracie Carrel, Ariah Carrel, Timothy Carrel, Madison Gearhart, and Robert Peterman; one step great great grandchild, Rylee Clay, along with a host of extended family and friends. Funeral services will be 1:00 PM Friday, December 7, 2018 at Caniff Funeral Home in Westwood with Pastor Steve Williams officiating. Burial will follow at Golden Oaks Memorial Gardens. Visitation will be Friday from 11-1PM at the funeral home. Casket bearers will be Larry Ritchie, Ed Ritchie, Timothy Ritchie, Brett Ritchie, Cody Ritchie, John Pauley, Timothy Kleinknight, and Larry Kleinknight. To send flowers or a remembrance gift to the family of Peggy Bayes, please visit our Tribute Store. "Email Address" would like to share the life celebration of Peggy Bayes. Click on the "link" to go to share a favorite memory or leave a condolence message for the family.